Look at what our home inspector found on a home inspection in West Fort Worth. Someone went to a lot of trouble to design and carefully construct this shiny, sheet metal front cover for a Square-D main electrical panel. 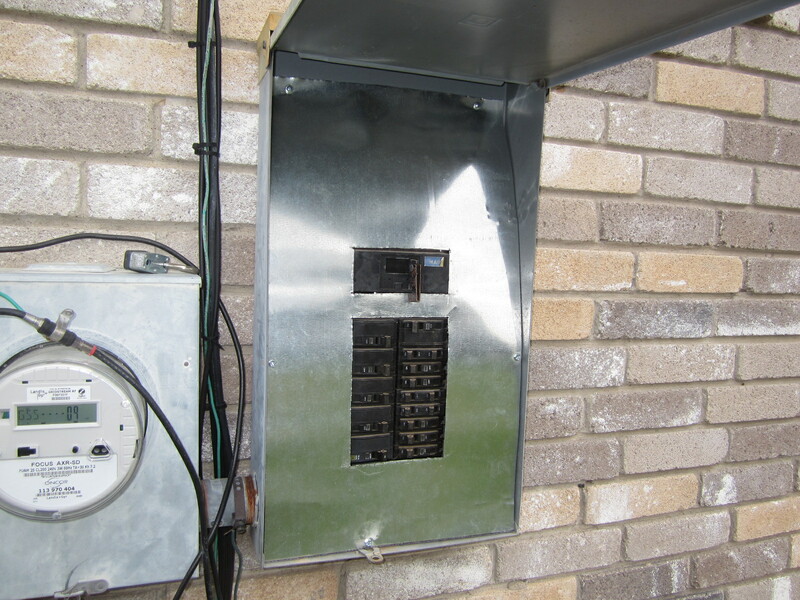 It is for a good reason that electricians call that cover plate the “dead-front cover.” What’s inside that panel can be DEADLY. Home inspectors are required to open up the panel, unless we consider it dangerous to do so. And believe me when I say that some of them are not as neat and tidy as this homemade panel cover. So, let’s talk about why this handy work qualifies as a “Surprising Inspection Discovery” for our blog. The manufacturer (Square-D) supplies a rigid, permanent, heavy gauge steel plate cover when they ship the panelbox. That steel plate is about as thick as a nickel – about 12 gauge. It’s designed to stand up under extreme conditions. Even so, we often see scorch marks on the back of those covers, from arching and contact damage. We see nicks in the edges of the covers from the melting heat – think of the temperatures on the SUN. The 26 gauge sheet metal cover plate our inspector saw is about the thickness of a piece of poster board for your child’s art project. And, if an arching condition were to occur, the entire sheet would probably disintegrate. In addition, if anyone were standing near it, they could be sprayed with molten metal. Giving a whole new meaning to the term “dead-front” cover. There were several other electrical deficiencies, which our home inspector identified during this inspection. So we were able to emphasize the importance of getting a LICENSED ELECTRICIAN to do an exhaustive electrical inspection of the whole electrical system, without scaring the client. After all, almost anything can be fixed on a house, but it’s our job to point out the potential problems before the sale. Realistically, most folks rarely see the electrical panel. But we do! And since it was in an exterior location, we don’t want any risky circumstances around any of those breakers. Keep it safe, and we all benefit. Please, folks, even if you don’t use House Exam Inspection for your home inspection needs, get a professional home inspection before you close the deal on that home purchase.